Stylin in St. Louis: My favorite color...Pink! Happy Tuesday! The outfit is on repeat. I wore this outfit a few weeks ago and I wore it again yesterday! I love pink! Especially this color of pink! I added a little teal to give it a summery look! This shirt is thin and allows me to breathe especially on such a hot day. Still keeps me warm while I'm at work in a freezing cold building! I had the amazing opportunity to be featured on the Trend Spin LinkUp today! Check it out HERE! Laura and Erin are some amazing fashionistas! Thanks Ginny! Love pink and teal! Thanks Elizabeth! I love new followers! You looked adorable in your 4th of July outfit! Perfection! Great outfit! Love the color combo! Congrats on your feature! Thanks Julia! Pink and Teal are such fun colors to mix! Especially during the summer! Love the pink and turquoise together! Thanks Sharon! Such a fun combo for summer! I loveeeee this top, pink is my favorite too! Thanks Carly! Pink is so fun! Flirty and girly! Love it! I LOVE this!! So cute yet functional!! I may be seeing a remake of this in my future! ...and your favorite color is gorgeous on you. I especially love the combination of pink and turquoise. Thanks Girl! Pink and Turquoise are so fun! Especially in the summer! I'm so happy to see how those shoes look on you! I ordered them months ago and they just shipped two days ago so I'm excited to get them! I wear these shoes all the time! Especially at work! They are comfy and the hell is not too high! You will love them! I find myself gravitating to hot pink more and more! 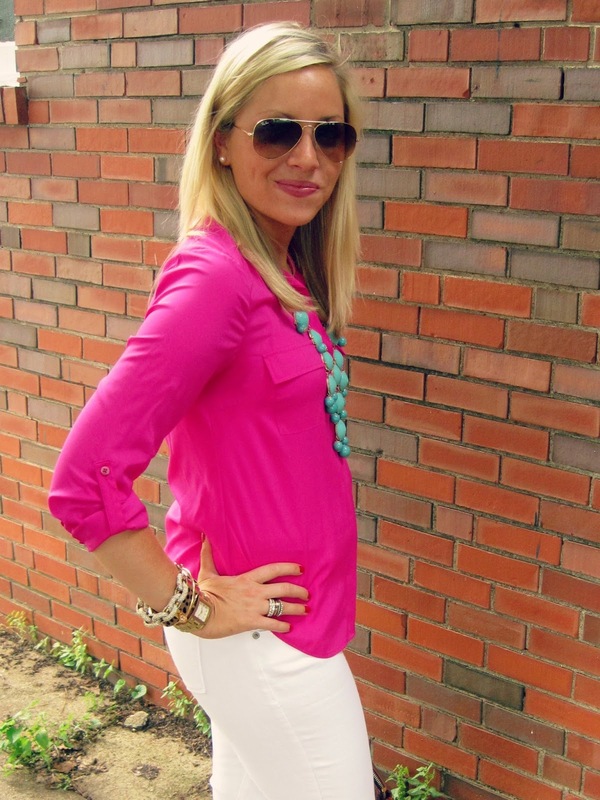 Love this top contrasted with the white pants! Hot pink would look great on you! Pink and White! Always fun in the summer! Love the pink and turquoise combo! Super cute! Thanks Katie! Love this combo so summer! 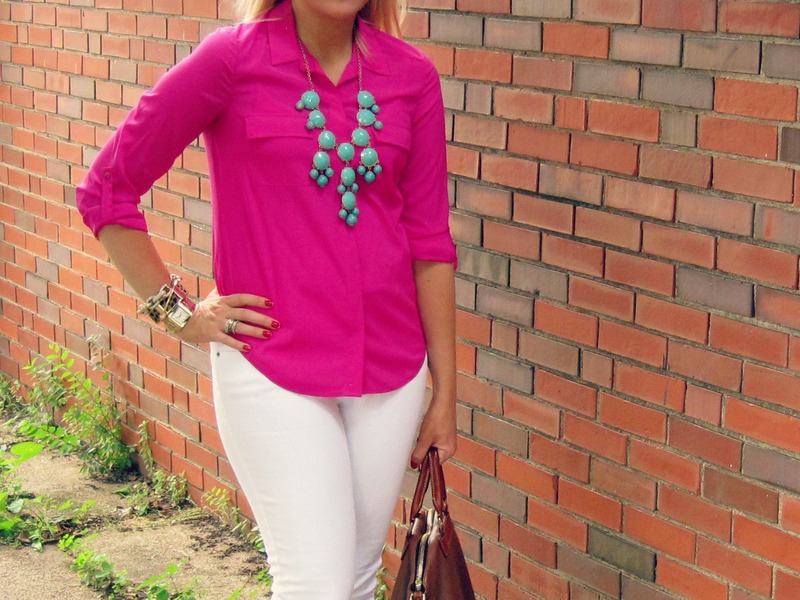 Love the turquoise as a pop of color against a hot pink shirt! Thanks Nicole! Pink and turquoise are so fun to pair! Love it in the summer! Just came across your blog from the the Trend Spin linkup! You are so cute and have such great style. I love this look. Hot pink looks unreal on you!! And your teal bubble necklace is perfect. I also LOVE your stripe skirt a few posts down. New bloglovin' follower!! Thanks Bree! I love new followers! You are so sweet! Pink is just so fun! My skirt I was wearing I got at J.Crew factory for a great deal! Love the top...hot pink looks great on you! And nothing pops better on a hot pink top than a turquoise bubble necklace! Pink and turquoise are such fun colors to wear together in the summer! Love the pink! I am a pink fanatic! And it looks perfect with the teal! One of my very favorite combinations. I freeze at work as well (and I am the only one that is ever cold) so I have to dress in layers so I don't freeze in the office but don't die when I step out into the heat. It is a difficult balance! Thanks Nikki! I had a pink room pretty much my entire life (except for college). My duvet cover in my bedroom has pops of pink in it too now. My husband would let me have a pink room, but I won't go too overboard for him. I always wonder why the workplace is so cold?! I sometimes can't move because I am so cold. We share the same favorite color! Blondes definitely look amazing in pink! Loving this blouse! I agree! Blondes look great in pink! Totally my favorite color too...you look fab! Thanks Nikki! Love this outfit! I have worn it more than once and will probably wear it again! Thanks for visiting my blog! I need that Dooney bag! I've been on the market for a new/vintage Dooney -- love it! Thanks Kelsey! My mom was going to throw this bag out and I was like "HOLD IT" I want it! So glad I did! I literally carry it everywhere! It is an oldie, but it is one of my favorite bags! Such a fun necklace! I have it in three colors! So fun to pair in the summer! Thanks you! Such a fun necklace! I agree! Anything pink and I will take it! Thanks Diana! You are so sweet! LOVE the pink & teal together - so pretty! Thanks Annie! It is such a fun combo for summer! Look at all of these comments you're getting! You are so cute! It's no surprise everyone loves your blog!